Some of our "NOROC ROMANIA" trekking trails are now registered with a performance GPS for those who want to explore by themselves our beautiful area! Alone, or in a group of friends, you will have the opportunity to discover some of our different levels trails, by means of our Garmin GPS Edge 800. Every morning will be a short briefing, you can choose to overnight in the same guesthouse or in different places, we`ll provide luggage transfer, car assistance, transfer from airport and back, GPS files for rent, half-board lodging in double rooms and picnic lunch. Is possible also to combine days from our trails, according to your wishes! You still have time to decide what is best for you and your friends. Private transfer from airport Bucharest to Sinaia (2 hours). Visit the famous Peleș Castle. Located in a beautiful mountainous region, at the foothills of the Bucegi Mountains, Sinaia is one of the oldest and most famous mountain resorts, often referred to as-The Pearl of the Carpathians. The beautiful region drew the attention of the Hohenzollern Royal House(Carol I - King of Romania) who built Peleș Castle, starting 1873. It became the summer royal residence. Prior to World War II and the abdication of the royal family, Sinaia was a summer retreat for Romania's aristocracy. Accommodation at New Aosta Garden guesthouse, built between 1911 – 1920 by closely vision and drawings architect and owner John W Luncan. Today you will traverse Bucegi mountains; from Sinaia you can take the cable car to Cota 2000m, or you can climb by foot on a steep and demanding ski slope. For a good level group is possible to reach the highest peak Omu 2505m. After a long and nice traversing on a ridge close to 2300m-the Old Guardian's road you have to descend on a narow path to your accommodation-The Mountain Rescue Guesthouse, where the owner and his team are friendly and ready to offer you all you need. Tags for today: technical parts, amazing landscapes, flying over the rocks. One steep uphill to Strunga saddle at 2000m high. Here you are in Leaota mountain where you can admire the Bran country. Continue with a long traversing and the last descending takes you to Moieciu de Sus, a mountain village where the most of inhabitants living from tourism and shepherding. Overnight in Daniela's guesthouse with very good services and traditional home-made food. Another day...crossing small and remote mountain villages like Dâmbovicioara, Fundata, Șirnea. Visit Bran Castle better know like Dracula's castle but no connection with him. For many years the castle was home to Queen Marie, Queen Victoria of England’s granddaughter. Accommodation in Măgura, a still remote and small mountain village. Pepino House will be your host and in the next day it will be hard to say good bye! A different day, initially at the edge of forest with many ascents and descents. The middle part of the route takes you through Zărnești Canyon, which belongs to our famous jewel Piatra Craiului mountain. You will surround the north part of this limestone mountain. Accommodation in a very nice chalet far away from civilization. From Zărnești we'll follow a narrow path who takes us at the foot of Piatra Craiului west side. Along the way we visit an ancient monastic shrine built in a cave. We also visit the local headquarter of Administration of Piatra Craiului National Park, where visitors receive explanations about the importance of environmental conservation in this unique area. Tourists will have access to extensive informations about the flora, fauna, and preservation of our area. Accommodation at a mini-hotel with very good conditions and food, in the middle of the nature, far away from civilization. You'll climb today to Șpirlea refuge and you'll continue to follow the path at the base of the impressive stone walls, which traverse places with unstable fragmented rocks. 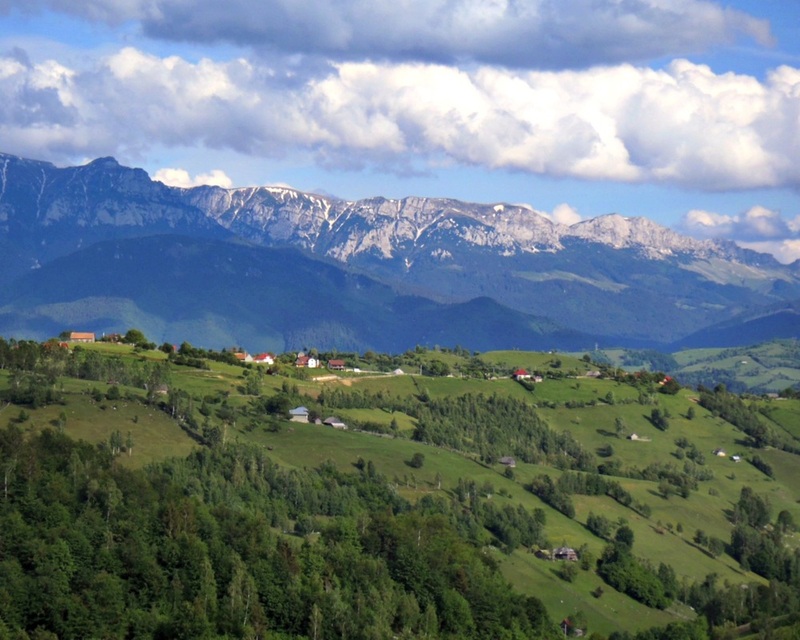 The view is beautiful, you can admire on your right Făgăraș and Iezer mountains. You'll pass near the Ceardacului cave and a strange, huge stone like a portal named Ceardacul Stanciului. The way back to Plaiul Foii is a path through forests and meadows plenty with berries bushes where the view of Piatra Craiului is stunning. Same accommodation. Private transfer to Brașov. City tour. Private transfer from Brașov to Bucharest airport for departure. Prices: for 6 person groups 590 euro/person. The price includes: 7 days half board accommodation and picnic lunch in double rooms, 6 days trekking tour, GPS files, private transfer from airport and back, luggage transfer between accommodation, T-shirt, resort fee.